Try something different for the Fourth of July!–How about grilled fish with a grilled-fruit salsa? This is a flexible, relatively simple dinner with lots of tasty variations! 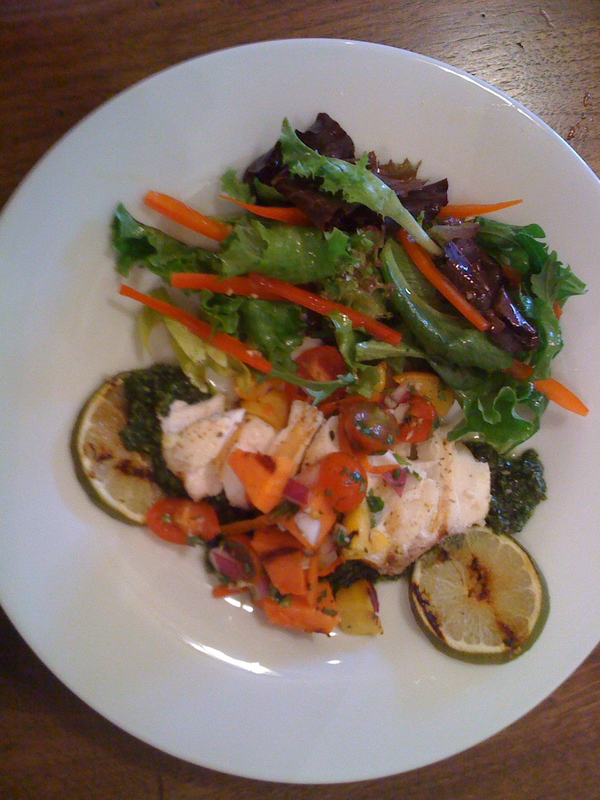 Here’s where we are going: grilled fillet of halibut on cilantro pesto, with grilled nectarine-papaya salsa and a salad of field greens and s hredded red pepper with honey-lime dressing. I just came up with these recipes and made this dinner tonight! (Practicing up for the Fourth.) Let’s take it step by step–I’m a beginner, so I’ll suggest a couple of variations along the way in case you don’t like some of the ingredients, but I hope you’ll suggest some other ways to go! This is a pretty comprehensive list of ingredients; note that you divide up these quantities to use in the different components of the dinner. You can make the pesto ahead (I make it every time one of my cilantro plants is about to bolt, which is about every 15 minutes or so!). It is very simple! Pinch off the leaves of a cilantro plant (or small bunch from the store) and put them in a Cuisinart bowl (I have a “mini-prep plus” that is great for small jobs like this). Add a chopped clove of garlic and a pinch of salt. Have on hand about a half-cup or more of nice olive oil; drizzle it into the mixture as you chop it up. (The cover of the Cuisinart has a little hole in it for this purpose.) I like a fairly coarse, thick pesto; if you want it to be thinner, you can always add more oil. That’s it! Put it in the fridge if you’ll use it within say a week, or freeze it in an ice tray and store the cubes in a freezer bag in the freezer. For this meal, you want enough to make a puddle on each plate below the piece of fish. The amount above should do for four. You could make this well ahead of time (even a day ahead); just re-whisk it before using. 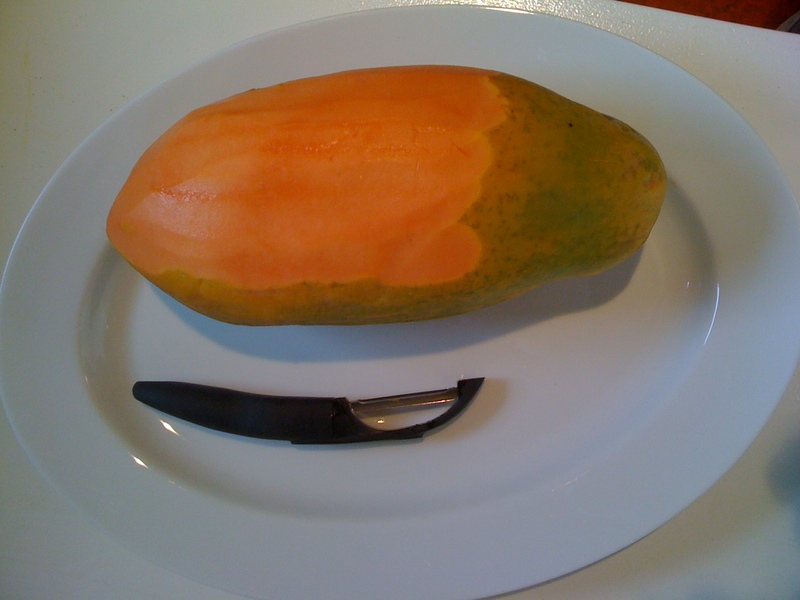 I first ate papaya in Guatemala in 2005–for breakfast, like cantaloupe! 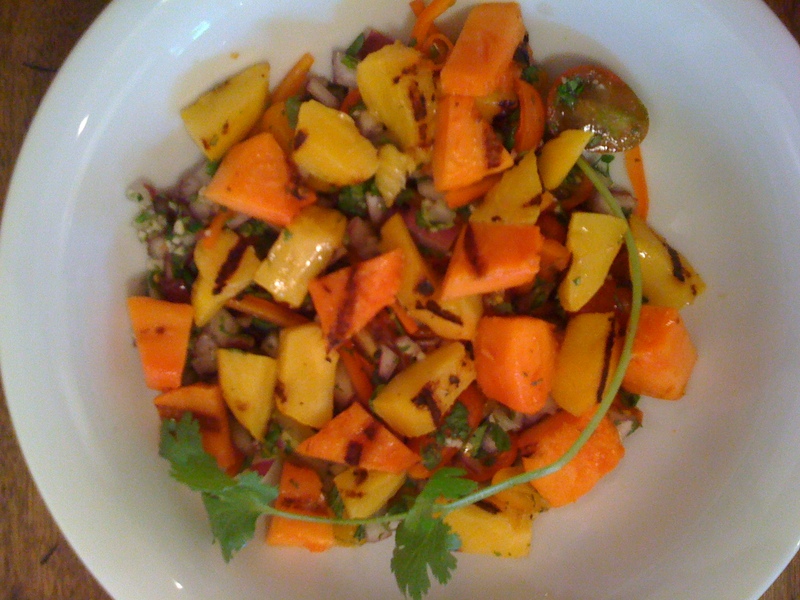 It’s really good with lime juice, which gave me the idea for this salsa. Gently toss all this stuff together. For four people, get one Mexican papaya or two Hawaiian ones. Also get about four nectarines. Be sure to get ripe fruit!–The end result will be only as good as the fruit. If you aren’t familiar with papaya, here’s a half-peeled Mexican one. (Be careful in peeling and slicing it; it will be a slippery devil!) It has seeds like a cantaloupe; cut it in half along the length of it and scoop them out. Then turn it cut side down and slice it into thick slices (at least one inch thick–you’ve got to be able to turn them on the grill without too many of them breaking apart). If you hate papaya or don’t want to try it, use cantaloupe instead–it also grills really nicely! Cut the nectarines in half around the stone, twist them off the stone (“unscrew” the halves), peel them, and slice them thickly (I get just about two slices per half). While you are at it, cut a lime in half and slice one or two thin pieces off each half. You can grill them briefly to make a nice garnish! Oil your grill rack and get it VERY hot. (I have a gas grill; I let it get up to 500 degrees.) Open it and quickly put down your slices of papaya, nectarine, and lime. (I use two small spatulas to handle the pieces so I can work fast and very few go down in flames.) I leave the top up because I don’t really want the fruit to cook; I just want to get some char on it. I leave them there for about two minutes, then turn them for another two minutes. (Sometimes I lower the hood briefly if the grill is cooling too much.) But don’t depend on time; look at them and make sure they are getting some char before you take them off. I take off the lime slices much more quickly than the other fruit–just as soon as they pick up some charred color. Then I rush the plate into the house and put it in the fridge–I don’t want the slices to cook, just pick up some color and flavor from the grill. I use the brush to clean the grill, but leave it on–we’ll need it for the fish. Now I have a glass of wine. Get the grilled fruit out of the fridge and carefully dice it so that you have evenly sized pieces with good color. Gently fold it into the basic salsa (I hardly stir it!–just place the pieces so that I can spoon a good cross-section of the mixture onto each piece of fish). Let that sit at room temperature while you do the rest of the prep. Get out your salad dressing and cilantro pesto and also let them sit at room temperature. Re-whisk the dressing if it needs it. Wash and dry your salad greens and tear into bite-size pieces. Core your red pepper, trim out the white edges and discard all the seeds, and shred it into very thin slices. Mix the greens and red pepper pieces. Oil your grill again and get it moderately hot (I shoot for around 400 degrees to start). Portion your halibut fillets (or whatever mild white fish you prefer). Have at least a quarter-pound piece per person. Rub the fish with a small amount of olive oil and dust the pieces with salt and pepper. Put them on the grill and close the cover. For a piece of fish about one inch thick at the thickest point, cook it one one side for about five to six minutes, then turn it over and cook for another say four minutes. You want it to begin to flake but be a little translucent in the middle–it will continue to cook for a bit after you take it off the fire. While the fish is grilling, toss the salad with the salad dressing. On each plate, make a “puddle” of cilantro pesto. When the fish is done, put one piece on each plate on top of the cilantro pesto. Spoon some of the salsa over the fish, and add a lime slice or two. Add a helping of dressed salad. Here we are! Serve with a piece of good crusty bread; have a dessert if you care to. I have to tell you, this was a very fresh-tasting, pleasant meal! If you try this recipe, please comment on how it went! This is my first attempt to actually write up what I do and call it a “recipe,” and I’d really like to get your feedback. 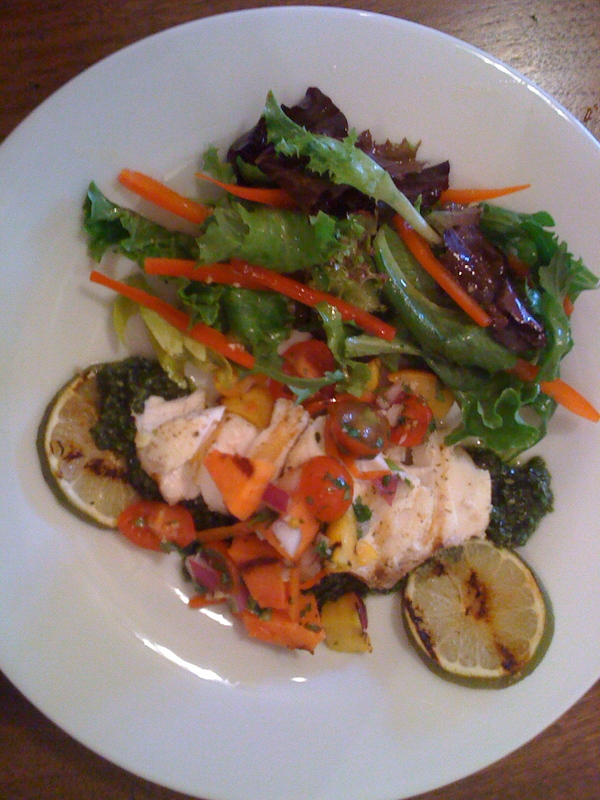 This entry was posted in Recipes and tagged halibut on the grill, how to grill halibut by judyramey. Bookmark the permalink.